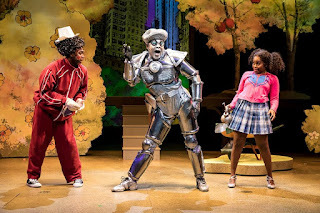 The Twin Cities Theater Bloggers all agree, ease on down the road to see The Wiz at Children's Theatre Company, a coproduction with Penumbra Theatre Company. Play off the Page says, "From the stunning costumes to the tremendous talent and energy of the actors and musicians, this was easily one of the best performances I’ve ever seen." Cherry and Spoon writes, "...the song and dance numbers are fab-u-lous. And this cast is so chock full of local African American music-theater legends, as well as up-and-comers and a few adorable tykes, that it blows the mind." Compendium - Minneapolis says, "The best part of this Wiz, bar none, is the stellar cast." Talkin Broadway writes, "The Wiz is a wonderful, and wonder-filled, experience for all ages. The music will send you, the story will swell your heart, and the show is, well, wicked good." Twin Cities Stages says, "The Wiz is one of the best tickets in town."